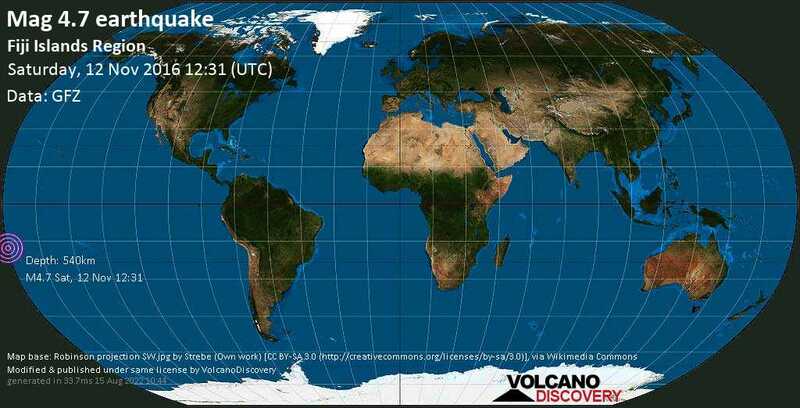 Nov 12 12:43: Magnitude recalculated from 4.9 to 4.6. Hypocenter depth recalculated from 553.0 to 547.0 km. Hypocenter depth recalculated from 547.0 to 544.0 km. Hypocenter depth recalculated from 544.0 to 541.0 km. Nov 12 12:46: Magnitude recalculated from 4.6 to 4.7. Hypocenter depth recalculated from 541.0 to 542.0 km. Hypocenter depth recalculated from 542.0 to 541.0 km. Hypocenter depth recalculated from 541.0 to 540.0 km.